Some good news on the injury front for everyone’s favorite enigma: Dustin McGowan. Chatted some with Blue Jays GM Alex Anthopoulos this morning and McGowan completed a pain-free bullpen session this morning. A small step, but an important one. Over the summer, McGowan walked away from a similar mound session with tightness in his surgically-repaired right shoulder. No such turn of events this time around. Dustin is definitely a pitcher to keep an eye on during Spring Training. If he’s healthy, he is a darkhorse for a spot on the pitching staff. –Anthopoulos admitted that the Blue Jays have talked internally about free-agent outfielder Johnny Damon and that he’s called Damon’s agent,who you may have heard of before, Scott Boras. Damon could fill left field and leadoff, but unless his asking price comes down I’m not sure how serious Toronto’s interest is right now. If the price seems reasonable and the Jays feel Damon could net some assets in a later trade, or by being worth a Draft pick if he qualifies as a Type A free agent again, the club may consider it. Would Damon consider the Jays? Probably not if he has an offer from a team with a better shot at contention. –Blue Jays manager Cito Gaston basically lobbied for the club to bring Carlos Delgado back to Toronto, even though Anthopoulos has said in the past that he’s not currently a fit for the team. Gaston feels Delgado could be a great asset for the young hitters. That said, he’d have to DH primarily and Anthopoulos said he prefers to leave Adam Lind in that role. 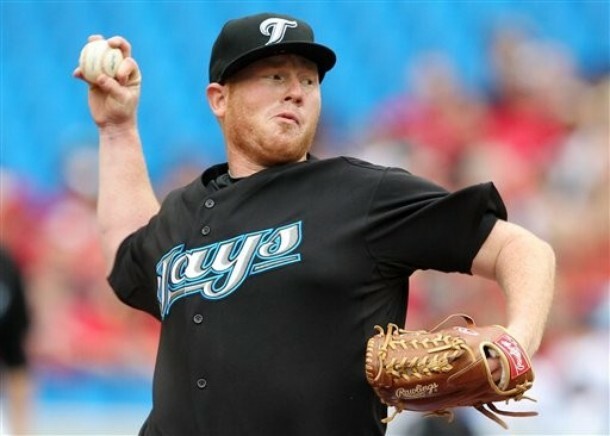 –Gaston and Anthopoulos both said they have confidence in John Buck as the starting catcher. Rod Barajas is still out there as a free agent, but the fact that he is worth a Draft pick when he signs elsewhere is big for the Jays. Had the club not commited to Buck, though, AA said the Jays would be been more serious about maybe bringing Barajas back. Raul Chavez is in the mix as the backup right now, but AA noted that he’s still seeing if he can bring another backup catcher into camp to compete for the job. –The closer’s job is “up in the air,” according to Gaston. He said there are “two or three guys” who can do that job. That’d be Scott Downs, Jason Frasor and… someone else. Asked about Jeremy Accardo, Gaston got him confused with Casey Janssen again. Then he laughed it off, saying “I get my guys mixed up there sometimes.” Anthopoulos said if Accardo has a strong showing this spring, he should be in a good position to make the cut for the bullpen. –The lineup? “Right now, if you asked me who was leading off, I would say [Jose] Bautista. Right now, if you asked me who was hitting third, fourth and fifth? I could probably give you some answeres there, but it might not be the truth,” Gaston said. The lineup will be a work in progress all spring. Gaston did say he feels the Jays have potential for a lot of power. “I think there’s going to be some power out there. We’ve just got to get it out of these guys this year,” he said. He said he believes guys like Lind, Hill, Bautista, Encarnacion, Wells, Snider and Overbay all have the potential to hit 25 homers. We’ll see. Cito also sees Bautista as a starting outfielder as things stand right now. –Gaston noted that the Jays might do some “crazy” things this season in order to score more runs. “We’re going to have some fun this year,” he said. “We’re going to do some crazy things, as far as trying to score some runs. It might look crazy, but it’ll work out.” Later, Cito elaborated, saying the club might play some more small ball — bunting more, maybe stealing more and definitely trying to get better with the hit-and-run, something Gaston said the team did not do well last year. “Hopefully we can execute some of the things we haven’t been able to do in the past,” he said. –The main complaint from the fans was in relation to marketing, wanting the club to do more in the community or at the ballpark to add to the entertainment value. President and CEO Paul Beeston said there is a marketing plan in place and admitted that the club needs to improve in that regard. The Jays Care foundation is doing a lot behind the scenes, though, as are the players. Also, “Doc’s Box” will still be at the ballpark, though likely under a different name, run by the JCF. Roy Halladay would host children from Sick Kids Hospital in his private suite throughout each season and that program will continue. –The turf at Rogers Centre was being ripped up and new long strips were being installed — no more squares of FieldTurf. Some players have complained about the previous playing surface, so hopefully the new stuff will get better reviews. It wasn’t completely installed yet, so we didn’t get a chance to really scope it out. 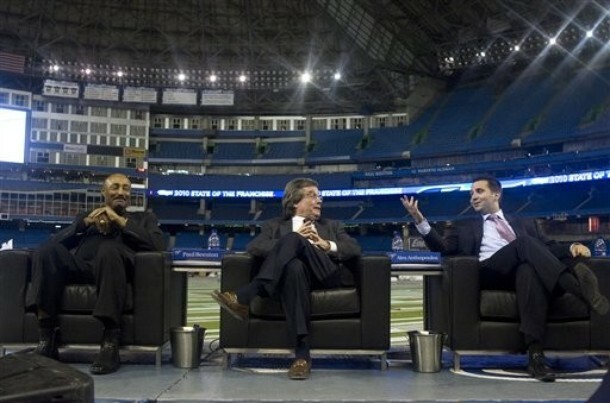 –Beeston emphasized that the Blue Jays HAVE money to spend on free agents if they need it. The payroll has been trimmed, but funds have been poured into scouting and player development, that’s the focus right now. He said when a young core is established, Rogers is ready and willing to pony up the resources to add high-profile players through free agency if it makes sense. They may have the money now, but the Jays don’t want to spend for the sake of spending. Q&A WITH HAYHURST: If you haven’t checked it out already, be sure to read my interview with Jays pitcher Dirk Hayhurst from earlier this week, discussing his upcoming book, “The Bullpen Gospels.” A great read. Check the previous post for my review of his book. It’s available for pre-order online and will hit bookstores on March 30. Chatted with Jesse Litsch for a bit on Monday evening. There will be a story on bluejays.com today about some of the charity work he’s been doing down in his home state of Florida this offseason. Recovering from Tommy John surgery has provided plenty of down time for Litsch to tackle such endeavors. On the baseball front, Litsch said he is scheduled to throw in his first bullpen session on Feb. 3. It’ll be his first time up a mound since going under the knife in June. Barring any setbacks, the Blue Jays are hoping Litsch will be recovered and able to help out their young and inexperienced pitching staff come June or July. When he does make his way back, though, there is no guarantee that Litsch will have a job waiting for him. And he knows it. 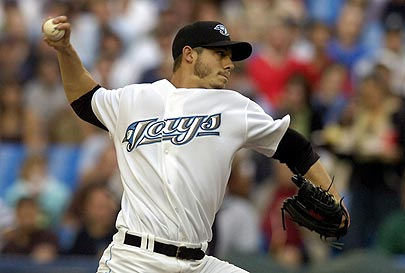 Without Litsch, the long list of rotation candidates includes Shaun Marcum, Ricky Romero, Brandon Morrow, Brian Tallet, Brett Cecil, Marc Rzepczynski, Scott Richmond, David Purcey, Dustin McGowan, Robert Ray, Brad Mills, Kyle Drabek, Zach Stewart, Reidier Gonzalez, Luis Perez, Casey Janssen… did I miss anyone? “There’s no doubt we’re going to be young, especially as a pitching staff,” Litsch said. “But, we have guys on the staff like [relievers Jason] Frasor and [Scott] Downs who have been through it for a while, and they’re going to help us out as much as they can. Tallet, if he’s in the rotation, he’s going to help out, too, as more of a veteran guy. “It’s obviously tough to see him go,” Litsch said. “But, in the same respect, it opens up a spot for someone else to come up and shine. It’s a matter of going out there and performing. When you’re out there performing, if you step up your game, you might not be like Halladay, but you could be. Blue Jays GM Alex Anthopoulos was fully prepared to head to an arbitration hearing, if necessary. That’s something Toronto has not done with a player since 1997. If any eligible players didn’t sign by Tuesday, negotiations would be cut off and a hearing it would be. On Tuesday, the Blue Jays settled the 2010 contracts for arbitration-eligible pitchers Jeremy Accardo, Shawn Camp, Jason Frasor, Casey Janssen and Brian Tallet. Shaun Marcum signed on Monday, while Dustin McGowan and Jose Bautista avoided the process earlier this winter. So, the streak lives on and the biggest winner of the bunch on Tuesday was Frasor. After a career year, Frasor received a $1.2 million raise and will make $2.65 million in the upcoming season. Tallet signed for $2 million, Camp for $1.15 million, Accardo for $1.08 million and Janssen for $700,000. Before the Halladay trade, I wrote more than once that the team’s payroll would likely remain around $80 million. Well, turns out that’s almost $20 million too high. After the Doc deal, and with Rios off the books, the player payroll will probably be in the $60-63 million range for the 2010 season. That’s NOT including the $10 million owed to B.J. Ryan or the $6 million sent to Philly as part of the Halladay trade. Here is a monetary breakdown: CF Vernon Wells ($21 million, including $8.5 million), 1B Lyle Overbay ($7 million), 3B Edwin Encarnacion ($4.75 million), 2B Aaron Hill (4 million), LHP Scott Downs ($4 million), SS Alex Gonzalez ($2.75 million), RHP Jason Frasor ($2.65 million), OF Jose Bautista ($2.4 million), LHP Brian Tallet ($2 million), C John Buck ($2 million), SS John McDonald ($1.5 million), RHP Shawn Camp ($1.15 million), RHP Jeremy Accardo ($1.08 million), RHP Shaun Marcum ($850K), RHP Casey Janssen ($700K), RHP Dustin McGowan ($500K). Other contracts: OF Joey Gathright will earn $550K is he makes the Major League roster. C Raul Chavez is also signed to a Minors deal and will likely have a similar salary when/if he is placed on the Major League squad as well. McGowan and Jesse Litsch will count against the payroll even if they aren’t on the OD roster. Litsch, at least, will be on the DL. That leaves roughly eight spots for players who make the Major League minimum. FALSE: A rumor quickly spread online today that the Blue Jays had signed veteran slugger Carlos Delgado. I wrote last week that Toronto was not pursuing Delgado and Anthopoulos went on the record to shoot down the latest rumor on Tuesday. Delgado’s agent was also quick to shoot down the rumor. MINOR SIGNINGS: The Jays also signed OF Jeremy Reed and RHP Steven Register to Minor League contracts with invites to spring training on Tuesday. Anthopoulos said Reed, like Gathright, will be given a chance to compete for a backup job or a full-time job in the Jays’ outfield. The main reason for Reed and Gathright? They play center. With Rios gone, the only backup to Wells in center right now is Bautista. Reed and Gathright could provide depth at the position and one will probably be on the roster come Opening Day. Snider and Bautista are also in the mix for starting roles in the outfield. ROLES: Anthopoulos said that manager Cito Gaston will determine who will be the club’s closer during Spring Training. Last year, the duties were split between Frasor and Downs. Frasor seems to be the top choice right now, but that could change in the preseason. Anthopoulos also noted that Tallet’s status as either a starter or reliever has not been decided yet. If the club doesn’t feel some of the young arms are ready, Tallet could open the year in the rotation.